Qcon is persistently dedicated to its commitment to excellence in Health, Safety, and Environmental (HSE) performance. We want to; we choose to, we will be HSE compliant. Ensuring Occupational, Health and Safety (OH&S) excellence are fundamental principles of Qcon business philosophy and management culture. Providing processes for continually improving the Occupational, Health & Safety within all Qcon activities. Applying effective OH&S management systems, with the objective of preventing or minimizing injuries and occupational health hazards within the core business. Maintaining compliance with State Laws and Regulations; working with the authorities to ensure compliance to applicable legislation. Ensuring that contractors and suppliers working for Qcon are committed to OH&S principles and demonstrate such commitment in all their activities. Recording non-conformances and incidents at all levels, and to apply these information to ensure that proper and efficient work practices are established. Making OH&S excellence both as an individual and management’s responsibility. Providing suitable training and safe working environment to ensure work activities remain within the established procedures and practices. Reviewing this policy for continuing suitability of its application, ensuring that it is well understood by our employees and is always available to interested parties and or the public. Compliance with all applicable Statutory Regulations, National and International Environmental Laws and other standard requirements which Qcon subscribes to. Implementation of an effective Environmental Management System to minimize adverse environmental aspects and impacts which would affect environment, endangered species, Qcon’s employees and other interested parties. Provide framework for continual improvement on Environmental Protection by setting Targets, Objectives and Programmes on relevant levels and function in our organization. Provide the necessary resources on education, trainings and skills, and the motivation of all employees so that this Policy is consistently implemented all throughout. Recording of non-conformance and any of the environmental emissions at all levels, and to use this information in ensuring that proper and efficient work practices are established. Assuring that contractors and suppliers working for Qcon commit to the environmental requirements of principals, and demonstrate such commitment in all their activities. Health screening, examination, treatment and further referrals to Government hospitals (including cases of chronic illness) of its employees and must be in line with Qatar Healthcare regulations, its Clients’ applicable standards and practices. This involves further evaluation and treatment, in close coordination with the Government hospital. In the event of admission to Government hospital, Qcon shall conduct periodical follow-up related to check the health condition of the confined employee in the hospital. Provide first aid procedures and emergency management of all work and non-work related injuries and illnesses at workplaces and at different Company premises, i.e. camps and accommodations. Manage fitness to work of all employees, in compliance with the applicable rules and regulations. Manage a risk-specific health surveillance at workplaces and other company premises periodically. Establish health surveillance programs for industrial workers, especially those exposed to all types of occupational hazards. Develop and administer a sickness absence rehabilitation and phased return to work program. Conduct health awareness sessions and manage education programs for occupational health, safety and hygiene. Manage work related/non-work related stress through a psychological support program. Maintain compliance with the Company’s health and safety requirements. Maintain a confidential record of employees at all times. Always maintain a high professional integrity, clinically and ethically. 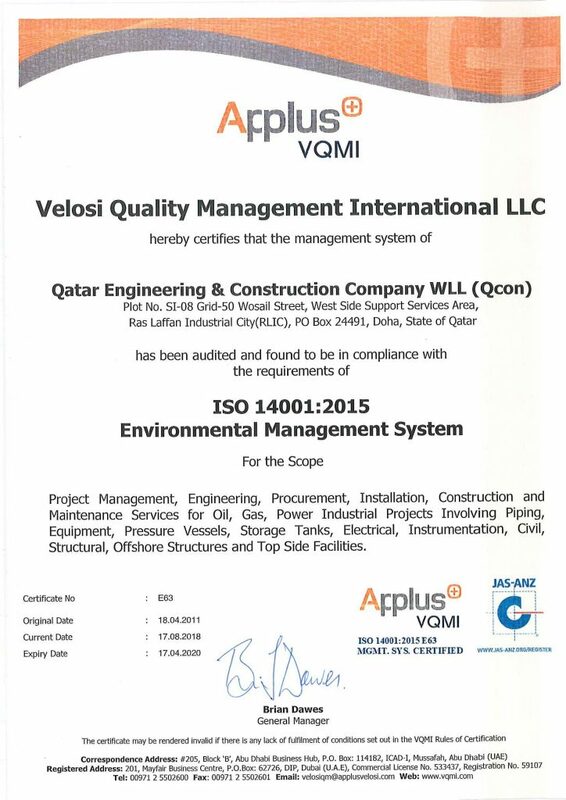 In 2011, Qcon obtained 3 important and prestigious certifications: ISO 9001:2015 (Quality Management System), ISO 14001:2015 (Environmental Management System) and OHSAS 18001:2007 (Occupational Health and Safety Management System). We are the leading National EPC & Maintenance Contractor in the Oil & Gas, Petrochemical, Fertilizer and Power industries; and we accomplish this with a tremendous team. 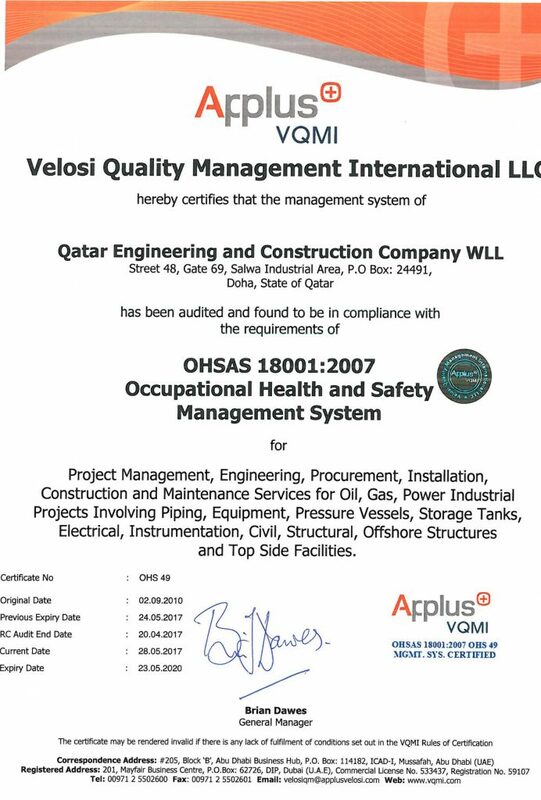 We are proud to receive the following HSE recognition and awards that highlight our standing as one of the top company. Qcon has created this database to provide safety-related information in the shortest possible time. We believe that communicating safety alerts, bulletin, campaign and lessons learned from incidents on all our worksites will contribute towards improving our safety standards and it will help us to avoid the same mistakes or error in the future. 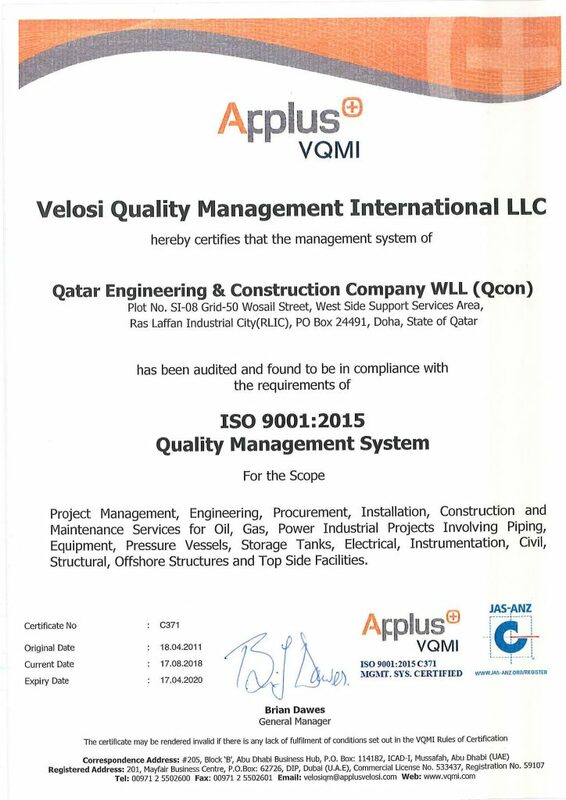 Qatar Engineering and Construction Company (Qcon) is the leading National EPC and Maintenance Contractor in the Oil & Gas,Petrochemical, Fertilizer, and Power industries.